Our Scotland vacation began with a flight from the Raleigh-Durham airport to the Charles DeGalle airport and then to Aberdeen. 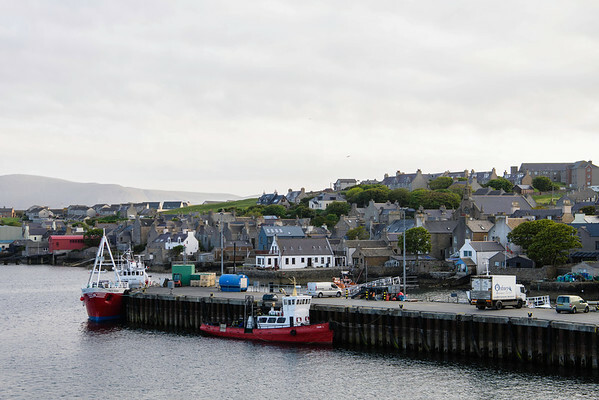 We rented a car in Aberdeen and drove to Scrabster where we got a ferry to Stromness. About two weeks of our vacation was spent at a rented house near Ophir on the Mainland island. During those two weeks we hiked and did some sight seeing. During this two week stay we took a ferry to the nearby island of Hoy to take a hike to the Old Man of Hoy. On Hoy there is a nesting pair of sea eagles. (This is a big deal for bird watchers or, as they are called in the UK, "twitchers".) On the road to the trailhead on Hoy, some Royal Society of the Preservation of Birds had set up a scope where passersby could see the eagles. After our two weeks on the Mainland island, we spent three days on Westray which is another small island with about 600 people and reportedly 6,000 sheep. While we were in Scotland we routinely quizzed people about the sentiments on the Brexit vote. The Scottish people are prosperous and happy and generally were inclined to Remain. We came home on the day of the Brexit vote and woke up the next surprised with the result. This gallery contains a variety of photos - Neolithic, Bronze Age, and Norse ruins, birds (Puffins! ), snapshots, pretty scenery and my attempts to explore photographic techniques (HDR). I have provided a little information with each image. In general, my objective is to provide providing enough information to fuel an internet search if there is additional interest. To start with, the Orkneyjar, http://www.orkneyjar.com/, is an excellent resource. The Stromness water front as our ferry from Scrabster arrived.